This colourful manuscript map with cross-rides of the trenches is included in a later Typescript version of the dedication to 'In Parenthesis'. Inscription includes: 6. 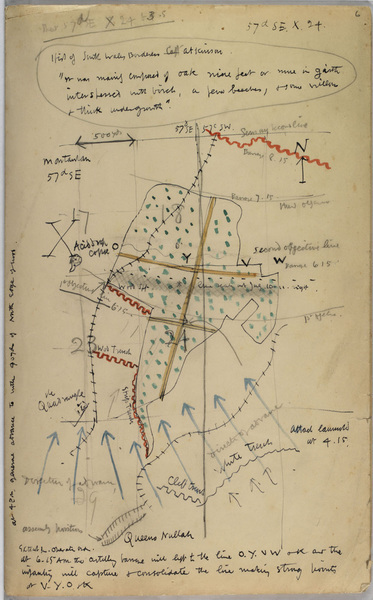 Map South Wales Borderers at Kinson 57dSE X24 'at 4pm general advance to with 40 yds of North Edge of wood...' Shows direction of advance from Queens Nullah, White Trench and Cliff Trench into Mametz Wood during the Battle of the Somme, July 1916 - the subject of Part VII of 'In Parenthesis'. That cross marks the various phases of the battle for Mametz Wood and line V, Y, O and K is mentioned in 'In Parenthesis' (Part VII). “In Parenthesis (title, map and dedication),” by Jones, David (1895-1974). The National Library of Wales / The David Jones Literary Estate via First World War Poetry Digital Archive, accessed April 22, 2019, http://ww1lit.nsms.ox.ac.uk/ww1lit/collections/item/6013.